3D printing is the process of creating physical objects from a three dimensional digital model. 3D printing technology is quickly evolving and public access to experiment with 3D printing is now available. 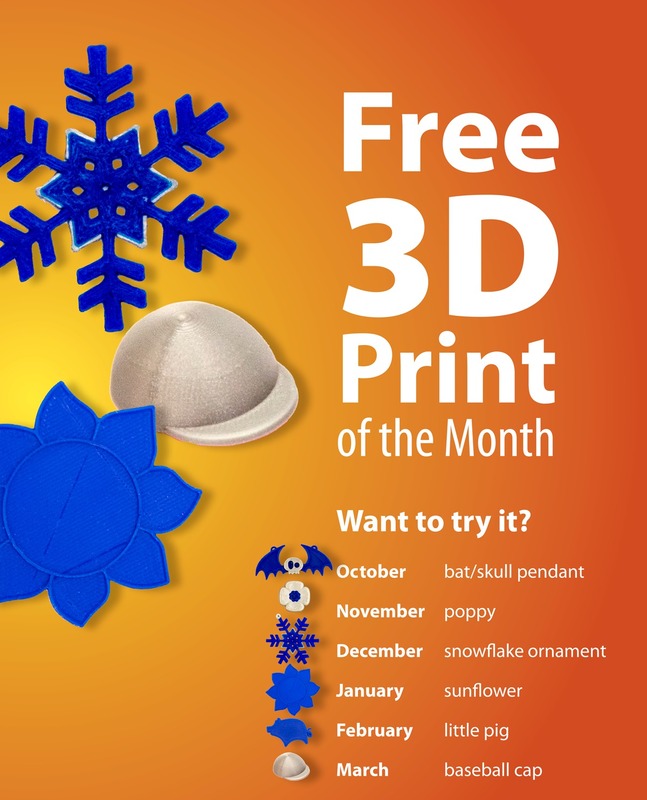 Each month we will be offering a free (15 minute or less) 3D print for the public. One free print per customer. The design is predetermined. Find a staff person to help you with your free print. Our 3D printer is the Ultimaker 3 with a 0.4 mm nozzle and the material PLA. The Ultimaker 3 offers a dual-extrusion print head with an auto-nozzle lifting system and swappable print cores. 3D printing is created one layer at a time, from the bottom up. If there are overhangs or arms in your design, your print may fail without supports. A small object may need a brim to help it adhere to the print surface. 3D printing helps designers prototype and improve their products. You may have to adjust with your file if the print does not print properly. Was it too complex? Was it too thin or have too much overhang? Printing time will depend on how complex the file is for the printer. Overall size, layer height, shell thickness, and fill density will impact print time. If you are not familiar with 3D modeling software, try printing an existing design. Browse and download 3D design files from a few different websites including Thingiverse and YouMagine or use the 3D Test Files on this page. 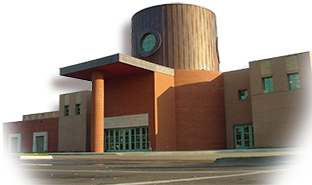 If you want to create your own design, use a 3D modeling program. The Make-It Lab and the Design Station Macs have Blender and SketchUP software installed. The public computers throughout the library have Microsoft’s 3D Builder installed. Make sure to save your file in .STL. .OBJ, .DAE or .AMF format. Take your file to the Media area and staff will assist you in preparing your file for printing. 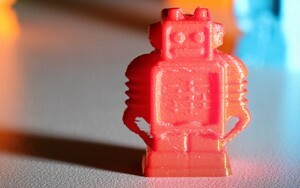 The Ultimaker3 printer uses software called Cura and requires a .GCODE file on an USB drive to print. Library staff will help you import your 3D design file into the Cura software. Opening the file in Cura will allow you to check the dimensions, reshape if necessary and it will give you an estimated printing time. 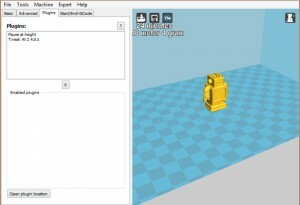 You can also use Cura yourself on Make-It Lab and the Design Station Macs or download the free software to your own computer. Maximum allowed print time is 3 hours per job. Staff will remove your completed print. Pick it up at the Customer Service Desk. Print jobs cost $5 each.